My first posting was guard duty at an R.C.A.F. North Brandon Station. After a week or so I was posted to Dauphin, Manitoba, along with seven other chaps, for guard duty at an airdrome under construction. After a couple of weeks the eight of us were posted, in error, to the (I.T.S.) Initial Training School at Regina. An I.T.S. is a training school for pilots and we had been assigned to train as (W.O.G. 's) Wireless Operator Air Gunners. We were kept in limbo at Regina for about two weeks while everything was getting straightened out. It was very pleasant in Regina. Here we were billeted at Regina College. It was spring and we really enjoyed ourselves there. We were then posted to #2 Wireless School, Calgary. It was the Technical Training School (now SAlT). 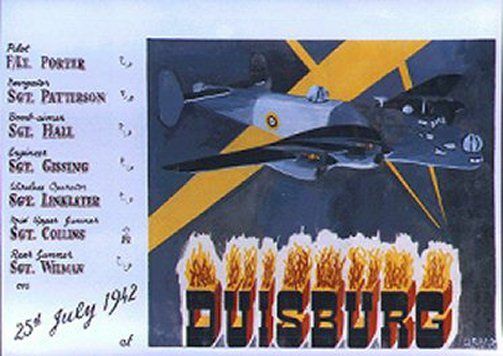 We were Flight 18Z and according to a group May, 1941 picture I still have, twelve out of our twenty-seven strengths were Americans who had volunteered to fight with us. Most of the twelve were ex-Marines or ex-Servicemen from the American Forces. A few of them were alcoholics and I remember one chap in particular called Ault who used to get the D.T. 's from drinking every payday. He would cry out at night about snakes and devils and I forget what else. But I do remember it was a new and unique experience for me to see and hear someone with the D.T.'s. Our Training consisted of learning the Morse Code and receiving the wireless messages by the code. Also the operations and technical aspects of our transmitting and receiving equipment. I recall the sets as being bulky and cumbersome. We also had a couple of training flights in Tiger Moths, sending and receiving messages while in flight. We also had lots of calisthenics, parade square marches, etc. I recall marching in the Calgary Stampede, where I was a marker at the head of the column, and I remembered to keep my eyes straight ahead when the "Eyes Right" command was given at the review stand. Being just out of school I had no problem with the course and I enjoyed the excitement and experience of being in the service. Upon completion of the course we were promoted to L.A.C. 's and received the Wireless Operator's badge. Two of our original eight dropped out of air crew at this point. Bill Fergie, whose father was a dentist in Cranbrook, and Vic Bellagente, whose parents were Italians living in Medicine Hat. We were then posted to Bombing and Gunnery schools for further training. There were two such schools on the prairies, at Dafoe, Saskatchewan and at Mossbank, Saskatchewan. I was posted at Mossbank. Our group of eight were split between the two stations. At Mossbank we practiced operating 303 Browning machine guns, assembling and disassembling them, etc. We had airplane recognition, map-reading, also types of bombs and their purposes. We had flights in Fairey Battles when we shot at drogues (large air socks towed behind accompanying planes). Our machine gun bullets were colored so each trainee's score could be rated according to how many hits he had on the drogue. We also had practice dropping bombs on dummy targets. All flight training occurred over the alkaline Lake Johnson so there was no damage to any property. While stationed here I had a chance to visit my sister Jane at Weyburn where by brother-in-law Joe was a construction foreman building an aerodrome. Our course lasted about a month. Upon completion we were awarded the W.A.G. 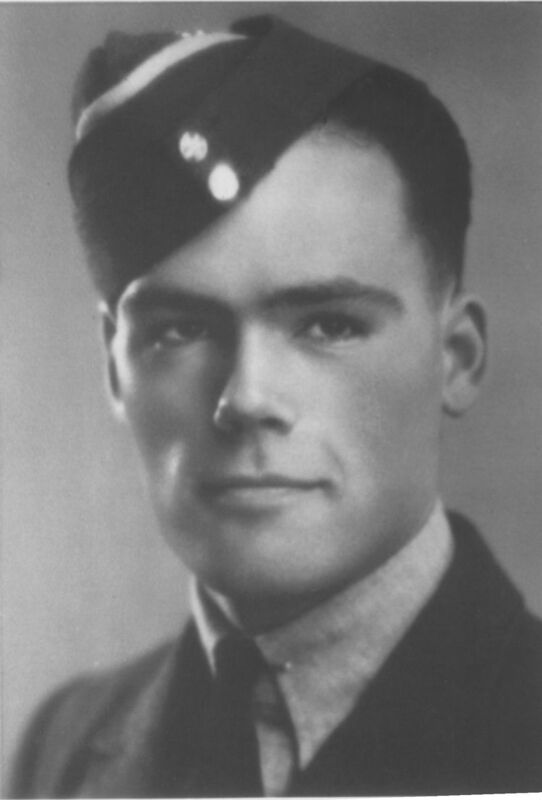 wing for Wireless Operator Air Gunner, and promoted to sergeant. I did well in my course here and I would have received a commission but the few commissions available were given to older fellows. I was among a select few chosen to report to Dorval, Quebec, after our embarkation leave. We were chosen to receive some additional training then to fly over to Britain with a lend/lease plane from the USA, probably a Hudson for Coastal Command. A few days after I was in Montreal/Dorval, the Japanese bombed Pearl Harbor and the Americans were in the war against the Japanese and axis powers (Germany, Italy, etc.). There was uncertainty as to whether or not the Americans would continue the lend/lease program so I was sent to Halifax to go to Britain by boat. There was a critical shortage of air crews so there was always an urgency to get us into action. This stood me in good stead because when I got to Halifax I was reunited with my pals; the Dunbars, Larsen, Dawdy and a few others who were still waiting for a ship. We decided to take the ferry over to Dartmouth for a celebration. In due course we ran afoul of something so the (SP's) Service Police were called to take us back to our barracks. We got to fighting with them and I recall Ray Herbert, who was an old fellow of twenty-eight, an exCanmore coal miner and used to scrapping, punched one of the SP's and broke the fellows eardrum. We all ended up in the guardhouse and we were held there a few days awaiting our fate. Then because of the need for air crews we were told to get our kit bags. We piled into the back of a truck and we were taken down to the loading docks. Everyone else had to march down carrying their kit bags, so we felt we had the last laugh.